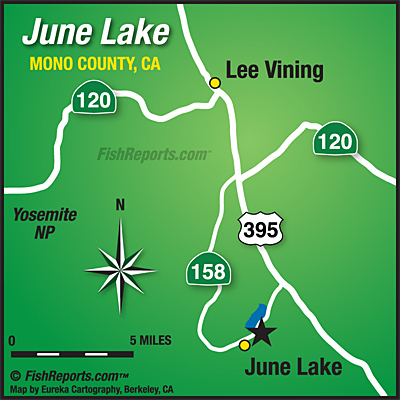 June Lake Marina (760) 648-7726 June is due to receive a load of Oregon Rainbows this week. Trollers are doing well 3 to 4 colors for Rainbows and deeper to 9 colors for Cutthroats. Bait and lure fishing is strong from boat and shore. "Snapper", one of our guys at Ernie's, has done well using jigs from shore mostly at the south end. Hillary at the marina points out that they have full and half day boat rentals, pontoon boats that are handicap friendly, and pay showers. Big Rock Resort (760) 648-7717 Mike at the Resort tells me that there's more Cutthroats being caught this year than past years which is a good sign for the population.